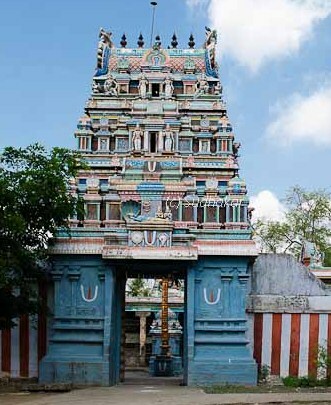 Velliyankudi also known as Thiruvelliyankudi is one of the 108 divya desams near Kumbakonam. As Lord Shukra (Venus) also known as Velli was supposed to have did a penance on this place the sthalam is called as "Velliankudi". Garudazhwar here has four hands holding the Sangu ( conch) and chakram (wheel). Since Lord Shukra, Lord Indra, Lord Brahma, Markandeya Maharishi, Parasara Maharishi, Mayan were all blessed by Lord Kola Valvilliraman at this sthalam here, it is beleived that visiting here is equivalent of visiting all the 108 divya desams. It is also believed that a visit to this temple will cure devotees of their eye problems. The Lord here is said to grant all of devotees’ wishes as can be seen from Thirumangai Azhvaar’s praise. The Moolavar of this sthalam is Sri Kolavilli Raman. The Moolavar is giving his seva in kidantha kolam (lying position) facing East. Prathyaksham for Sukran,Brahma,Indhran, Parasuraman,Mayan, Markandeyan, Bhoomadevi. The Thayaar in this sthalam is Maragathavalli . Temple location It is situated around 14 kms from Kumbakonam near Swamimalai Temple. Town buses are available from Kumbakonam to Tiruvaikavur that goes via this place. Velliyankudi can be reached by buses from Kumbakonam to Anaikarai. Get down at Senganoor and it is a kilometer away. Autos are available.The best bet is to travel by your car or hire a car to see the temples around Kumbakonam. It is not advisable to rely on the buses if you have a time crunch.Station at Kumbakonam and visit many heritage temples in the surrounding area of within 15 kms radius. Where to Eat?There are no restaurants in Velliyankudi. You can reach Kumbakonam for lunch / dinner. Other important places around Velliyankudi Since this is a little off the regular route, you need to retrace to Kumbakonam to visit other temples.